Getting a travel cot is useful for so many different situations. Grandparents can fold out the cot when they’ve got the little one for a night or a few hours and put it away the rest of the time. You can, of course, take it away on holiday and always know you’ll have a travel cot to use. But finding the best travel can be hard so I’ve put together this guide to help you find the exact travel cot you need. I’ve included some of the different things you have to think about and then given my recommendations of the best travel cots and provided a short review of each. Can I Use A Travel Cot At Home? Sometimes you don’t have space for a full-size cot but your baby’s outgrown their moses basket so you need something to use in the meantime. That makes a travel cot the perfect solution. My only suggestion would be to get a different cot mattress. The mattresses that come with the travel cot tend to be for shorter term use so might not be as sturdy. 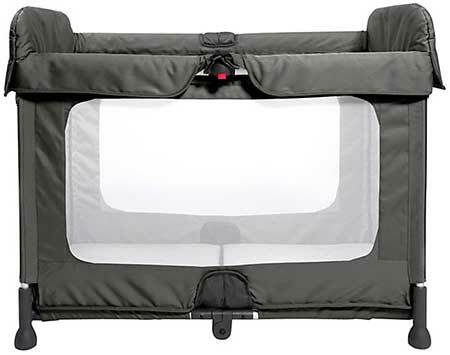 Most travel cots should fold up into some sort of travel case for easy transport so that is, of course, a must. All the travel cots talked about in this article do, it’s more if you’re buying second hand it’s something to be aware of. Aside from that you also want to be aware of the weight as you’ll be the one carrying it! And then if you have trouble carrying things you get some that have wheels so that’s always an option. How Long Can I Use A Travel Cot? It varies a lot from one baby to another but in general, they’re good from birth till 2-3 years old. If they look too big for it they probably are. Pretty much anywhere! At work, at home, at your friends, on holiday, visiting the inlaws. As long as it’s indoors and you have enough space to pop it up you can go ahead and do so. The only issue is that they can be very deep and on the floor, so if you have back problems or you’re recovering from pregnancy you might struggle to pick up and put down your baby. For Most it’s absolutely fine but for those with back issues I wanted to mention. Here’s a rundown of some of the best travel cots available that’ll have your little one sleeping soundly no matter where they are (at least for a little while). 30 million kids have been carried in Baby Bjorns various baby carriers which is quite a feat! They have a very sturdy travel cot that is ultra lightweight so carrying it around is an absolute dream. The mattress inside is very good quality and will stand the test of time even if you use it every night. Babybjorn themselves offer great customer service, any problems at all they’re always happy to help, even if you lose the case just call them up and I’m sure they’ll sort you out with a new one. 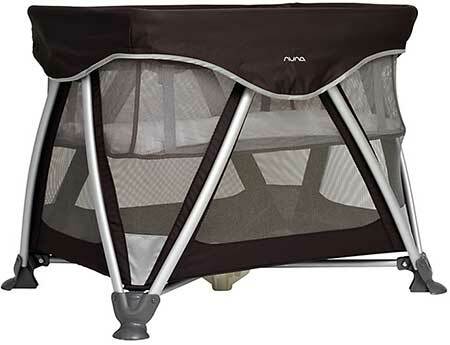 The Nuna Space travel cot is pretty nifty because it has a raised sleep space so you don’t have to bend all the way in to put your baby to bed. The raised sleep space then gets removed and you can use the cot as a playpen. It’s got a mattress pad over as opposed to a mattress so it’s not suitable for overnight use but the 2 in 1 makes it a great choice for on the go or occasional use at someone else’s house. It’s also got padded feet so it doesn’t slide around on wood floors. 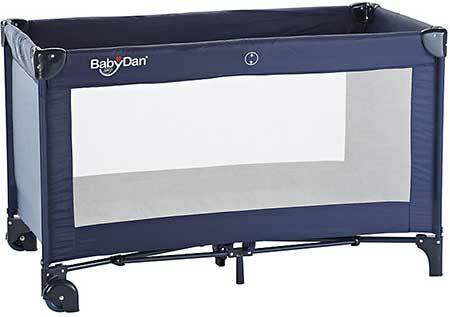 The BabyDan travel cot is an ideal basic occasional use travel cot. The mattress isn’t the best so you might want to get a better one if you’re going to be using it a lot. But it’s a low price anyway so it’s not a big ask. This one has handy wheels on one side which poke out of the case so you can pack up and wheel off at a moment’s notice. This does add a little extra weight but that gets compensated for with the wheels. The frame is very solid and will hold up nicely over time. 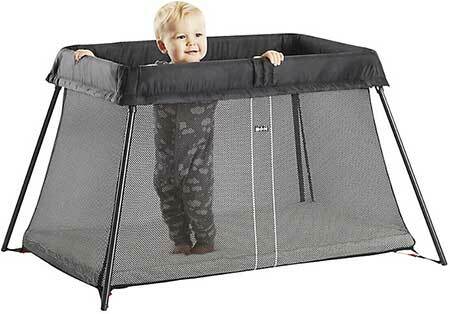 The Space Cot travel cot comes with two levels so you can use it for sleeping in and as a play pen. This has a premium mattress included as opposed to a mattress pad and they say you can use it from birth to 30 months. The bottom is raised off the floor which helps keep it a bit warmer which is great for the winter months and if you have a wooden floor. It’s also got a nice easy to use lock so that it won’t somehow get folded up with your baby in it. First off, this absolutely needs a mattress to go with it. It’s just a thin base layer that’s included so don’t get suckered to deep into the price. 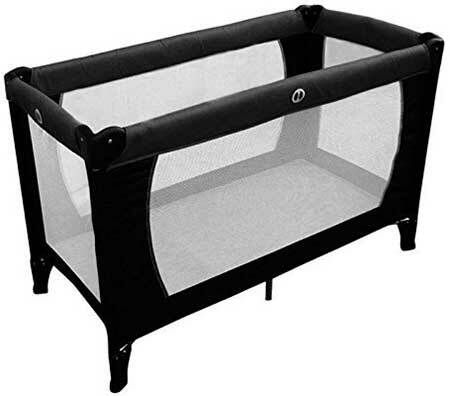 That said it’s still a good price and a nice basic travel cot. Nothing special but if you get an extra mattress it’ll be fine for occasional use or while you’re on holiday. A good choice for a tight budget.